We know that few things are more aggravating than being out on the town and having your cell phone battery die out on you. 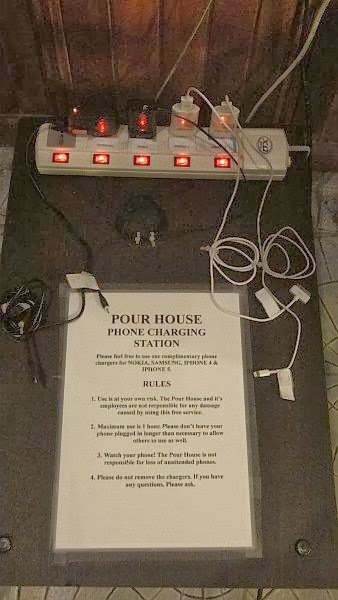 As a complementary service, The POUR HOUSE now offer free cell phone chargers for NOKIA, SAMSUNG, IPHONE 4 and IPHONE 5. Just drop into the Pour House and plug yourself in. They invite you to use their FREE WiFi as well! 1. Use is at your own risk. The Pour House and it’s employees are not responsible for any damage caused by using this free service. 2. Maximum use is 1 hour. Please don’t leave your phone plugged in longer than necessary to allow others to use as well. 3. Watch your phone! The Pour House is not responsible for loss of unattended phones. 4. Please do not remove the chargers. If you have any questions. Please ask.